GETTING behind the wheel of a new Range Rover doesn't happen all that often. Not that the fine folk from the British brand are unwilling to throw around the keys, it's due to the fact that this hallowed off-roader has a long life cycle. After more than 40 years, this is only the fourth generation. But don't expect to find a new Range Rover in the cheap and cheerful aisle. They start from $168,900 for the 3.0-turbo diesel. We sampled the Autobiography derivative, armed with a 4.4-litre oil-burner which is a hefty $232,800. The supercharged petrol V8 is the range-topper, costing $240,100. Regal and stately in every facet, there is nothing frugal about the Range Rover cabin. It's a stand-out for its stately persona and high-quality materials. The headrests are the most supple we've sampled across all luxury marques. Range Rover has resourced its hulking SUV wonderfully and despite an array of technological prowess, it's easy to use. The central touch-screen has fixed touch pads on either side for quick access to the most popular operations - meaning you don't have to dive through various menus to find what you're after. Getting inside can be a challenge for the elderly or ladies with tight skirts (this model sits 20mm lower in access mode), although the driver's pew is electronically lowered and steering wheel raised automatically to allow for easy entry and exit. Oh, and the front seats also offer a massage. The digital driver's display with analogue-looking gauges is modern while maintaining the dignified facade, and there are folding armrests up front to complete the lavish environment. Despite having a similar footprint to the outgoing model at nearly 5m long, the new Range Rover has extra space in the back - 118mm more legroom in fact. Two adults would best appreciate the space, and they even get their own zone of climate controlled air-conditioning. An all-aluminium body has helped deliver massive weight savings - more than 400kg. Together with a revised line-up of powerplants, the Range Rover has never been more efficient or powerful. Despite its robust dimensions, the Range Rover is surprisingly easy to drive. Sure, if you hammer into a corner with too much speed you get typical body roll and dive under brakes (engineers haven't found a way to defy gravity yet), but smooth operation of the steering and accelerator results in an ultra quiet and cushy ride. Plant your right foot and the 4.4-litre turbo diesel responds lustfully with a fine exhaust note, and the eight-speed automatic transmission is rarely out of step with well timed changes. On the highway the Range Rover sits beautifully, hardly working much above 1000rpm at 110kmh with barely any noise from the 22-inch Contintentals or the engine. For those wanting to step off the bitumen - we're not convinced how many would in this price bracket - it does possess ample dexterity. Air suspension can be adjusted up to 295mm and all you need do is match the terrain to the images (such as gravel) on a console dial for the appropriate four-wheel drive mode. 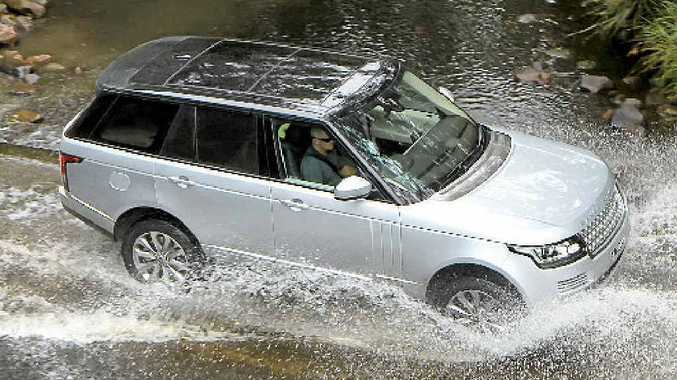 The wading depth has also been improved, and the Rangie can drive through up to 900mm of water. It's surprisingly easy on the juice. We achieved about 9.5 litres per 100km, slightly higher than the official figure. Owners have managed excellent fuel economy from the Range Rover in the previous iteration - and we've had rave reviews from grey nomads even while towing. Ongoing maintenance can be expensive, especially with spare parts and tyre replacement. Everything goes into the Autobiography, although there are still some items on the options list that cost you more (like metallic paint, active rear locking differential and a rear console cooler). The Rangie can be extensively tailored with an array of colours, finishes and various details, so you can have one which befits your tastes. But the standard items include smart key entry and push button start, four-zone air-conditioning, heated wood and leather steering wheel, satellite navigation, Bluetooth, powered hatch, 18-way electric front seats, Xenon headlights with auto high beam, rain-sensing wipers, front and rear parking sensors with reversing camera, and a superb Meridian sound system with screens in the back and a dual-way front touch-screen which enables the front passenger to watch TV or a DVD while driving. As expected, you get the highest in safety ratings, with the likes of stability control, anti-lock brakes and trailer control functionality standard across the line-up. The Range Rover is really in a realm of its own, but there is also the Mercedes-Benz GL 450 CDI (from $171,200), Lexus LX570 ($140,400) and Porsche Cayenne V8 Diesel ($155,500). With ample space for five adults, an excellent boot and split tailgate, the Range Rover has plenty of flexibility. Four adults would be best suited to enjoy the luxuries within. There's also a full-sized spare, and it has a 3500kg towing capacity. Sharp lines of old have been smoothed, but the Range Rover maintains a definitive presence. It still demands attention without showboating. The shark gills behind the front wheel arch, "floating" roof line and quintessential grille are the design highlights. Four generations in more than 40 years, Range Rover designs its vehicles for the long haul. This new edition is ultra plush, quiet and easy to drive, with even better off-road going ability. Not that too many buyers will step off the black stuff. Still, it can pull the horse float to polo or pony club economically with the occupants enjoying the most refined ride available in this genre. The good stuff: Luxury personified, impressive fuel economy, brilliant internal features. What we'd like to see: Lower prices and more no cost options for the range-topping variant. Warranty and servicing: Three-year 100,000km warranty, with servicing annually or 20,000km. Details: Five-door upper large luxury four-wheel drive sports utility vehicle. Engine: 4.4-litre V8 turbo diesel generating maximum power of 250kW @ 3500rpm and peak torque of 700Nm @ 1750-3000rpm. Consumption: 8.7 litres/100km (combined average). Performance: 0-100kmh in 6.9 seconds. Towing capacity: 3500kg, tow ball maximum 350kg.